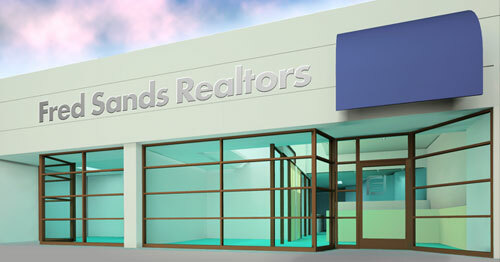 I designed a number of real estate offices for Fred Sands Realtors, including locations in Hancock Park (Los Angeles), Brentwood and Pacific Palisades, California. The Pacific Palisades office was doubling in size, and while the basic design vocabulary of the original office was simply being expanded, the client wanted to add some vibrancy to the entry and conference room area. The front of the building faces north, and is further shaded by trees, making the entry rather too dark. I proposed opening a large light-well in the roof and directing light into both the entry and a conference room facing the street. These rendering were created in Lightscape, which does an exceptionally good job of Depicting lighting and the impact of light on an architectural environment. 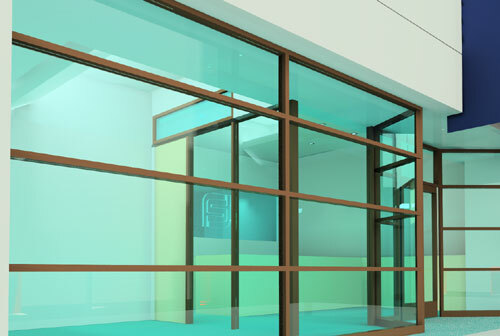 Architectural renderings, Lightscape, retail store design, real estate office, Pacific Palisades, California. 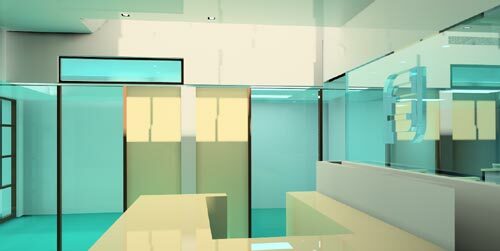 3D Studio Max modeling, architectural models by Mike Roy, Integrated Arts. Exterior of building looking into conference room and reception area. Interior--from reception desk looking toward skylight well and conference room.